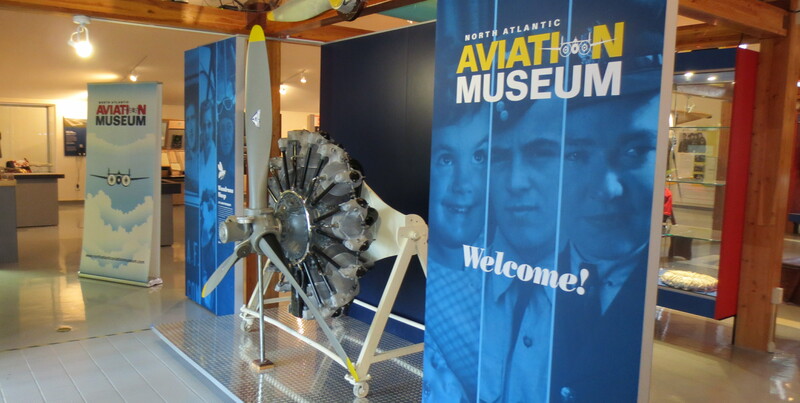 The North Atlantic Aviation Museum opened its doors in 1996, and is dedicated to preserving and presenting stories and artifacts highlighting Gander’s role in the development of Trans Atlantic Aviation. In the spring of 2012, the museum completed extensive interior renovations, creating a modern and professional exhibit, with engaging multimedia displays and a brand new flight simulator. The exhibit, covering the time period from 1935 to 2001, provides a rich narrative of Gander’s short but fascinating history. Learn about Gander’s role as an important strategic base during WWII, how the town earned the nickname “Crossroads of the World”, why Gander was known throughout the Eastern Bloc, and finally hear the story of Gander’s unexpected role, in the days following 9/11. The Museum’s collection focuses on North Atlantic aviation history as it pertains to Gander and Gander International Airport, from the 1930’s through to present day, with the bulk of the artifacts, photos, and text focusing on the WWII years through the early jet age. Highlights of our collection: We have several WWII aircraft engines, a restored WWII DeHavilland Tiger Moth bi-plane, a WWII Lockheed Hudson MkIIIA mid-range bomber (which we are told is one of only 8 left in the world, and is the only one in North America), a 1950’s CF101 Voodoo jet, a 1930’s Beech 18-S, and a 1940’s Canso PBY-5A Water-bomber. Of special interest, above the main entry we have positioned the tail section of a DC-3 (1930’s model), and out the back of the building, overlooking beautiful Gander Lake, is the cockpit of the DC-3, which visitors can enter from inside the building.